Cools blood heat, nourish Yin, clear Heat, tonify Heart, calm the spirit, calms shen. Palpitations, anxiety, restlessness, uneasiness, insomnia, poor memory, short attention span, poor concentration, constipation, mouth and tongue ulcers. Rheumatic valvular heart disease, hyperthyroidism, neurasthenia, menopausal symptoms. 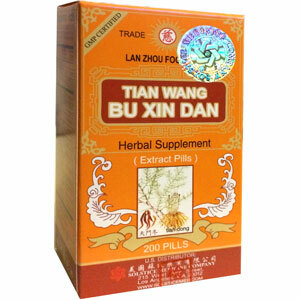 Tian Wang Bu Xin Dan supports the health of the heart. Calms simple nervous tension, relieves occasional sleeplessness and improves absentmindedness. Cools blood heat, nourish Yin, clear Heat, tonify Heart, calm the spirit, calms shen. Palpitations, anxiety, restlessness, uneasiness, insomnia, poor memory, short attention span, poor concentration, constipation, mouth and tongue ulcers. Rheumatic valvular heart disease, hyperthyroidism, neurasthenia, menopausal symptoms. Not to be used during pregnancy. Not recommended for long term use or in excess of recommended amounts, in cases of frequent copious urination, ulcers, gastritis, peptic ulcers, loose stools, diarrhea, lack of appetite, early stages of coughs or rashes, spitting of blood, or tuberculosis. Use with caution in cases of abdominal distention.